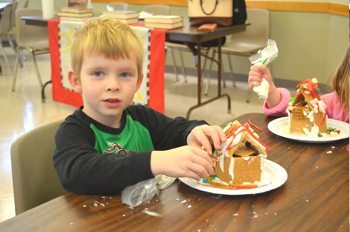 Many children and their parents enjoyed making a graham cracker house at the Grand Island Memorial Library on Saturday, December 10th. This is an annual event that is always filled to capacity. The library will be closed on Saturday, December 24 and Monday, December 26 in observance of the Christmas holiday. The library will be OPEN on Saturday, December 31 from 10:00 am - 5:00 pm and closed on Monday, January 2 in observance of New Year's Day. 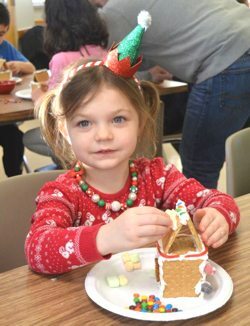 The Grand Island Memorial Library will offer programs during the December break. On Wednesday, December 28 from 2:00 to 3:00 p.m., there will be an open session of our Lego Club. The event is open to all children ages 6 - 12 years old. Family movie afternoon will be held on Thursday, December 29 at 2:00 p.m. All ages are welcome to attend the movie, but children under the age of 6 must be accompanied by an adult. No sign up is necessary for these programs. For more information, and to find out our movie selection, visit the library or call 773-7124. 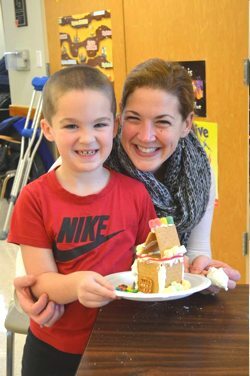 Make a Graham Cracker House will be held at the Grand Island Memorial Library on Saturday, December 10 at 2:00 and 3:00 p.m. All ages are welcome; however, we ask that parents accompany children ages 6 and younger to the program. Space is limited and registration is required. Registration begins November 12 at 10:00 am. For more information, or to register, visit the library or call 773-7124. 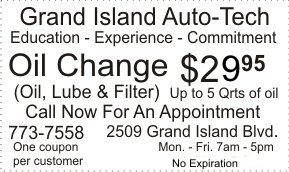 This program is funded by the Friends of the Grand Island Memorial Library. Celebrating Fall on the Farm on Thursday, November 17 from 6:30 - 7:30 p.m. This program is for children ages 3 to 6 featuring stories, games, crafts and more. Magical Creatures on Friday, November 25 from 2:00 - 3:00 p.m. This program is for children ages 6 to 10 featuring stories, games and crafts as we explore the world of mythical creatures. Space is limited for both programs and registration is required. For more information, call 773-7124, or sign up at the library. Friends of the Grand Island Memorial Library will be sponsoring a used book sale at the Library on October 28th and 29th. On Friday, the sale will be from 5:00-8:00 p.m. for Friends members only. Memberships are available at the door. Saturday will include "Fill a bag" for $5 from 10:00 a.m. to 1:00 p.m. followed by $2 a bag from 1:00 p.m.- 3:00 p.m. Donations of used books will be gratefully accepted at the library. 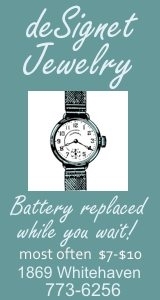 For library hours, call 773-7124. The Grand Island Memorial Library will be hosting a flu and pneumonia vaccination program administered by the Visiting Nursing Association on Saturdays, October 8, October 22 and November 5 from noon until 3 pm. Flu vaccinations are offered for persons ages nine and older. A parent or guardian must be present and sign consent for ages 9 - 17. 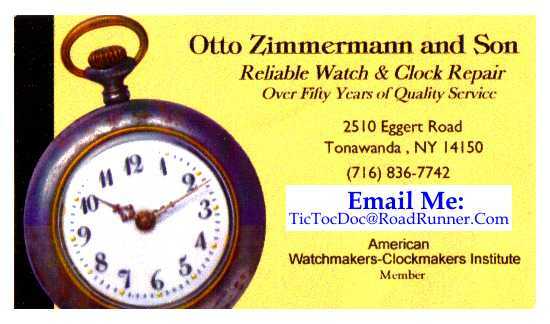 The following insurance is accepted: Medicare Part B, Blue Cross/Blue Shield, Independent Health and Univera. Fall sessions of the Preschool Story Hour and Toddler Time Lapsit Program at the Grand Island Memorial Library begin in September. The Preschool Story Hour features stories, songs and crafts for children 3 to 5 years old. Children must be 3 years old by September 19, 2016. The program will be held on Monday mornings, from 10:30 a.m. to 11:30 a.m. beginning on September 19 and on Tuesday afternoons from 1:30 p.m. to 2:30 p.m. beginning on September 20. The Toddler Time Lapsit Program will be held on Wednesday mornings, from 10:30 a.m. to 11:00 a.m. beginning on September 28 and features stories, songs and finger plays for children 18 months to 3 years old. Each child must be accompanied by an adult caregiver. Children must be 18 months old by September 28. Registration is required for these programs. To register, or for more information, call 773-7124, or sign up at the library. The Grand Island Memorial Library will be closed on Labor Day, Monday, September 5th. Summer programs at the Grand Island Memorial Library begin July 5th. Visit the library or call 773-7124 to register for any of our library programs. Preschool Story Hour, Monday or Tuesday mornings, beginning July 5, 10:30 - 11:30 am, for ages 3 - 5 years old, registration is necessary. Toddler Program, Wednesdays, beginning July 6, 10:30 - 11:00 am, for ages 18 months - 3 years old, with an adult caregiver, registration is necessary. Book Marks Club, an independent reading club for children of all ages; visit the library to register and receive your reading log. Rookie Readers, Tuesdays, beginning July 5, 2:00 - 3:15 pm, for children entering grades 1 & 2, registration is necessary. Page Turners, Thursdays, beginning July 7, 2:00 - 3:15 pm, for children entering grades 3- 6, registration is necessary. Lego Club @ the Library, two sessions beginning Friday, July 8, 10:30 - 11:00 am, for children ages 6-12. Space is limited and registration is required. Registration begins June 1. Bike Drawing - enter to win one of 2 bikes in the library's contest between June 20 - August 11. For details on the drawing, visit the library. Battle of the Books, for students entering grades 6 - 9, registration is necessary. Wonder Makers presents folktales, Wednesday, July 13, 2:00 pm, for ages 5 - 12, children age 5 and under must be accompanied by an adult, no registration necessary. Teddy Bear Olympics, Thursday, July 14, 6:30 - 7:15 pm, for ages 3 - 6, accompanied by an adult. Bring your teddy bear and participate in games and crafts. Space is limited and registration is required. Omni Puppet Theater, Wednesday, July 20, 2:00 pm - for all ages, children age 5 and under must be accompanied by an adult, no registration necessary. Niagara University Repertory Theatre, Wednesday, August 3, 3:00 pm, for ages 6 - 12, children age 5 and younger must be accompanied by an adult, no registration necessary. 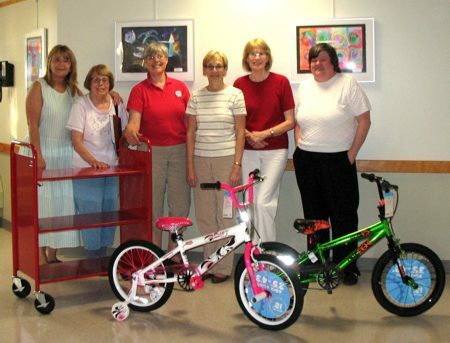 The Friends of Grand Island Memorial Library have purchased three new book carts for the Library, as well as two bikes that will be raffled to lucky summer readers. You'll notice the new book carts because they are bright red! The library staff is especially pleased that they move very smoothly and make no noise! Beginning June 20, when young people take out five books, they will receive an entry for the bike raffle. At the Summer Celebration on August 11 the bikes will be awarded to the lucky winners. The Friends raise funds for these and many other projects by selling used books that citizens donate. Book donations are accepted any time that the library is open. Two Annual Book Sales in spring and fall, as well as the Book Sale Room at the back of the Meeting Room and the Book Sale Shelves near the library entrance provide many opportunities for purchasing gently used books at bargain prices. When you donate books, or purchase them, you are helping the Friends provide extra supplies and programming for our Library. Thank you! Join the Grand Island Memorial Library Book Club for a special presentation from Brian Castner, author of "The Long Walk" on May 23rd at 6:30 p.m. Mr. Castner is a Grand Island resident who writes about his experiences serving three tours of duty in the Middle East with the U.S. Air Force as head of an Explosive Ordnance Disposal unit. All are welcome to attend. For more information, visit the library or call 773-7124. 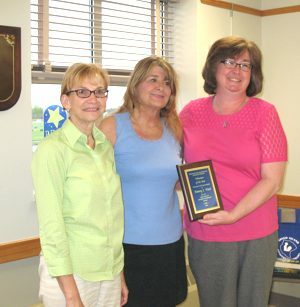 From left: Trustee Jill Banaszak, Volunteer of the Year Nancy Vizzi and Carole Joseph, last year's recipient of this award. 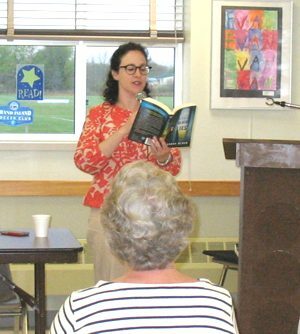 The Friends of the Library Annual Meeting was held on Thursday, May 12th. Nancy Vizzi was named Volunteer of the Year and local author Sandra Block discused her book, "Little Black Lies". A local author, Sandra Block, will be discussing her exciting mystery/thriller books, Little Black Lies and Woman Without a Name at 7 pm on May 12th at the Grand Island Memorial Library. The presentation will be preceded by the Friends of the Library Annual Meeting and election of officers, during a short business meeting. Library volunteers will be recognized and thanked for their many efforts. The public is invited and delicious refreshments will be served. The Grand Island Memorial Library will be closed on Wednesday, May 11 for Staff Development Day. The remainder of the week the library will be open its regular hours. Spring Sessions of the Preschool Story Hour and Toddler Time Lapsit Program at the Grand Island Memorial Library begin in May. The Preschool Story Hour features stories, songs and crafts for children 3 to 5 years old. Children must be 3 years old by May 2, 2016.The program will be held on Monday mornings, from 10:30 a.m. to 11:30 a.m. beginning on May 2 and on Tuesday afternoons from 1:30 p.m. to 2:30 p.m. beginning on May 3. The Toddler Time Lapsit Program will be held on Wednesday mornings, from 10:30 a.m. to 11:00 a.m. beginning on May 4 and features stories, songs and finger plays for children 18 months to 3 years old. Each child must be accompanied by an adult caregiver. Children must be 18 months old by September 30. Registration is required for these programs. To register, or for more information, call 773-7124, or sign up at the library. Celebrate Library Week at the Grand Island Memorial Library. On Monday, April 11th at 6:30 p.m., we will hold a Family Story Time featuring the wonderful world of Eric Carle for children ages 3 - 7 years old with their families. Create a Mini-Book with David Wasik will be held on Saturday, April 16th at 11:00 a.m. Space is limited and registration is required. All ages are welcome for the book program, however, children under the age 6 of must be accompanied by an adult. For more information, visit the library or call 773-7124. The Friends of the Grand Island Memorial Library will be holding a Used Book Sale at the Grand Island Memorial Library, 1715 Bedell Road on Friday April 8th and Saturday, April 9th. On Friday, the sale is open from 5:00 p.m.-8:00 p.m. for Friends members only. (Friends memberships are available) The sale is open to the public on Saturday from 10:00 a.m. am until 3:00 p.m. There will be a fill a bag for $5.00 from 10:00 a.m. to 12:45 p.m, then the clearance sale for $2.00 a bag from 1:00 p.m.-3:00p.m. Proceeds are used to benefit the library. For more information call the library at 773-7124. The Grand Island Memorial Library will offer a yoga program for children ages 3 - 5 years old. Space is limited and registration is required. The sessions will take place on Tuesday mornings from 10:30 - 11:00 a.m. on April 5, 12, 19 & 26. Parent/caregiver must remain with their child and be willing to participate in the class. The class is taught by a certified children's yoga teacher through Kidding Around Yoga (www.kiddingaroundyoga.com/donna). For more information, or to register, visit the library or call 773-7124. Please bring your Library card, any usernames and passwords associated with your device as well as its USB cord, if applicable. Space is limited and registration is required. Please specify which session you prefer. These programs are for adults only. For ALL classes, please bring your library card. A copy of the curriculum for each class is available at the library. For more information, or to register, visit the library or call 773-7124. The Grand Island Memorial Library will offer programs during the March break. On Monday, March 21st at 2:00 p.m., a Star Wars Jedi Academy for children ages 6 - 12 years old is planned. Space is limited and registration is required. Family movie afternoon will be held on Wednesday, March 23rd at 2:00 p.m. On Thursday, March 24th at 3:00 p.m, Charlie and Checkers will present a Spring Break Show. No registration is necessary for either of these programs. All ages are welcome for both programs, however, children under the age 6 of must be accompanied by an adult. For more information, visit the library or call 773-7124. 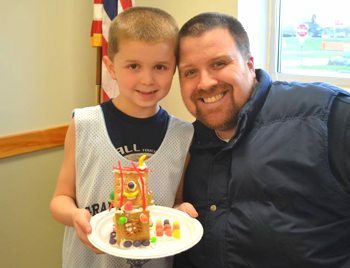 The Grand Island Memorial Library will offer programs during the February break. On Wednesday, February 17 at 2:00 pm, Gravitational Bull will present a juggling program. Family movie afternoon will be held on Thursday, February 18 at 2:00 pm. All ages are welcome for both programs, however, children under the age 6 of must be accompanied by an adult. No sign up is necessary for these programs. For more information, visit the library or call 773-7124. The Grand Island Memorial Library will celebrate Take Your Child to the library day with a Family Movie Afternoon on Saturday, February 6th at 2:00 p.m. All ages are welcome, however, children under the age 6 of must be accompanied by an adult. Refreshments will be served. No sign up is necessary. For more information, visit the library or call 773-7124. The Board of Trustees and the Friends of the Grand Island Memorial Library invite the community to meet Patricia Covley, the new Library Director. The reception will take place on Monday, January 25th from 5 to 7 pm in the library's meeting room. All are welcome to attend. Refreshments will be served. For more information, visit the library or call 773-7124. The Grand Island Memorial Library will be closed on Monday, January 18 in observance of Martin Luther King Jr. Day.